Mint-the word itself is very refreshing. As a kid I always use to dislike mint, but slowly I developed tasted for it and now I enjoy it using in many different ways. 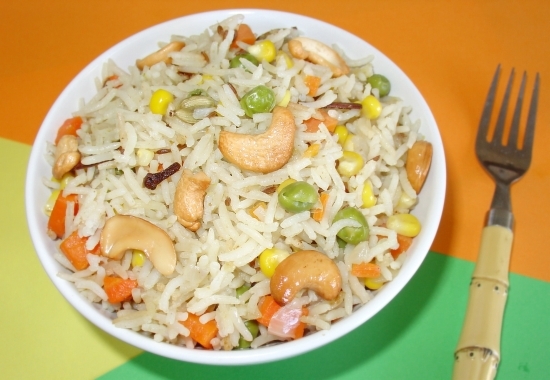 Mint pulao is a very easy dish where nothing can go wrong. On a busy day I always go for one pot meals . Rice dishes are really easy to make, just throw all the ingredients in one pot mix, stir and let the rice cooker do the job and I get time to relax. I love the aroma when it cooks . In a heavy bottom sauce pan add ghee fry cashews until light golden brown , now add bay leaves, cardamom, cloves, cinnamon and fry light, add ginger garlic paste, sliced onions and fry until the raw smell disappears. Now add garam masala and fry for a minute. Now stir in mint paste and sauté for 4-5 minutes, add rice , green peas and soy chunks. Mix well; turn the heat to low and sauté the mixture for 2-3 minutes. Now shift the rice mixture into rice cooker, add water lemon juice, salt and mix well. Turn on the rice cooker and wait for the beep!! Alternative you can use pressure cooker/pressure pan instead of rice cooker and cook for 3 whistles on high. Wait till the pressure releases, open the lid and light mix the rice using a fork. Do not over mix. Serve with raita or any gravy side dish. Beat yogurt with little water add salt, pepper and chopped vegetables mix well, adjust the taste and garnish with coriander leaves and serve, if you are not using immediately I would recommend to put it back in the fridge until needed. You can add coconut milk (1 cup), cubed potatoes, carrots, pretty much whatever is available and you like. Onion Baath and off on Vacation!! I’m in the process of cleaning up my fridge as my long-waited vacation to India is just hours away. I’m left with couple of onions and few tomatoes which is good enough for onion baath. When we were kids after coming from school at 3.30 in evening my mom use to give us rice, mostly mix rice as we use to take lunch boxes and around 6 pm she use to give us light snack. Onion baath is one of our favorites, we use to eat it with plain yogurt with out making any fuss. Heat oil in a deep skillet, add channa dal, urad dal, mustard seeds and fry until the dals turn into golden brown and mustards seeds pop, add green chillies, curry leaves and onions. Sauté onions until soft and transparent add turmeric, tomatoes and cooked until the tomatoes are soft and mushy. Turn the heat to low add salt and cooked rice, stir well adjust the taste, garnish with coriander leaves. Serve warm with plain yogurt. Happy Cooking and Happy Sankarnti !! Cooking for one person doesn’t need to be boring and I’m not a kind of person who can just eat junk. Other day my husband had a lunch meeting and lil one already told me that he wanted to have dosa. I was the one left out and yesterday night’s leftover rice was looking at me. I was not in a mood to make elaborate meal and hence deiced to go with one pot meal. Fired rice is one of my favorite. I learn’t this yummy dish from my sister and it can be put together in no time at all. Add one table spoon of oil to a hot wok/pan. Add rice and 1 tbsp soy sauce and stir fry. Cook for 3 to 4 minutes. Remove from heat before the rice starts to pop. Keep aside. Heat remaining oil in the same wok/pan. Once the oil is smoky hot, add onions, carrots, peas, pepper flakes/chilli paste, spring onions (white) and stir fry for 2-3 minutes on high heat. Add remaining soy sauce, ajinomoto and white pepper. Stir fry for 2 more minutes on high heat. Stir in the rice, sugar and salt to taste. Stir fry all together for couple of minutes, mix lightly taking care not to break or crush the rice. Add the spring onion leaves (green) and remove from heat. Serve hot with any Chinese gravy or wet Manchurian. You can add capsicum and cabbage to this dish. You can use chilli sauce instead of chilli paste and ketchup instead of sugar. The other Chinese fired rice. First time when I had Chinese fried rice I was totally surprised by its taste. The rice was white, light and fluffy and tasted delicious. I always used to wonder how it’s made, until I started preparing. I didn’t know that white pepper and ajinomoto were the secret ingredients. I’ve always consider fried rice as the best of all comfort foods. Just imagine of it – a bowl of perfectly cooked steaming white rice, (just to the right consistency), filled with vegetables and simple seasonings where you can get all the healthy ingredients in one pot. What could be more perfect than this easy breezy dish? 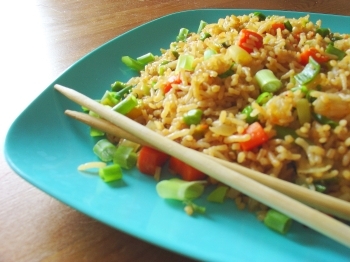 Ideally, fried rice should be light, fluffy, and easy to pick up with chopsticks/ fork. There is always a debate over which way of using rice is better – fresh cooked rice or leftovers from last night’s meal. It depends on individuals. I prefer to use cold leftover rice, but most of the time I end up making with fresh cooked rice as it’s always last minute decision. There are dozens of varieties of fried rice, each with their own specific list of ingredients and also tastes differently. leaves and let it cook for 5 more minutes. Leftover rice works well for this dish. You can add soy sauce for extra flavor. Quick and easy way to get cold rice is, cool down the fresh cooked rice to room temperature and spread it on a plate and keep in fridge for ½ hr (or until done with ur preparation and stir fry). I remember first time when I tried this dish, I don’t say that it was a flop, my husband’s comment was “this is more like carrot curry mixed with rice”. So this time, I browsed and got few tips from online and added my own touch and it was a hit. Flavoring plain rice gives a nice taste, on the same time it doesn’t over power the dish. Building flavors is the important fact in any dish. Like adding saffron gives a nice touch, taste and go well with carrots. Nutmeg is another spice blends with carrots. 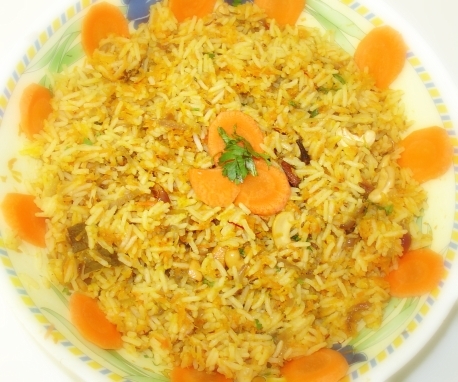 Aromatic basmati rice cooked with carrots, onions and spices. 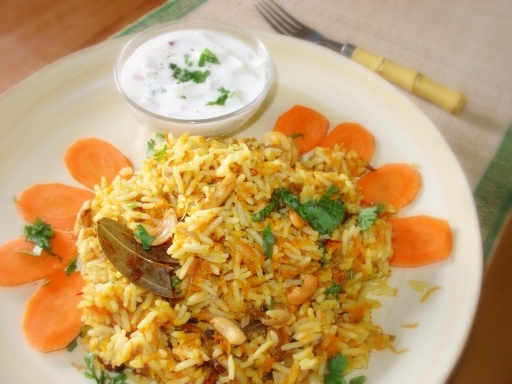 Carrots add a mild sweetness to this pulao, which is lightly flavored with whole spices. Saffron enhances the flavor of the dish and adds a nice aroma. Carrot is a good source of vitamin A and rich in dietary fiber, minerals and antioxidants. Heat 2 cups of water, add pinch of carwayseeds (Shajeera) , biryini mogga, 1 bay leaf, few peppercorns, salt and bring it to boil. Filter the broth and add this broth to rice and cook. Cool the rice. Heat oil in a skillet over medium heat. Add the bay leaf. cumin, cloves, cardamom pod, cinnamon and peppercorns. cook until the spices puff up and darken, then add the sliced onion and sauté until translucent . Add grated carrots and cook till done, keep stirring in the middle.Add salt, rice and mix well, but lightly, turn off the heat and toasted saffron, cashew nut and garnish with coriander leaves. You can make entire dish on stove top, Soak rice in water for 1/2 hr and process is same till carrots are added, here drain the rice and mix will carrots and add flavored broth, salt and increase the heat ,bring the water to boil, reduce heat and put the lid and cook on low heat till done. Keep stirring in the middle. Don’t mix too many times.Turn off the heat and let the pan stand covered on the stove for 5 minutes. then uncover, fluff up the rice gently, add saffron, cashew nuts and coriander leaves and serve with your choice of side dish. Pilaf means delicious grain( white, brown or wild rice) mix cooked in a mixture of delicately chopped herbs, vegetables, fruits, nuts and aromatic stock ( or water). Rice is roasted along with spices, vegetables and nuts for a short time in fat, and then cooked in stock or water with a variety of seasoning and spice blend. 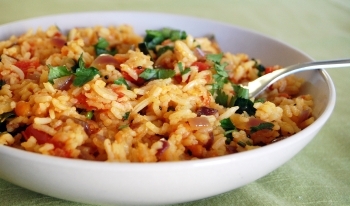 A vegetarian rice pilaf can be cooked with a combination of onions, carrot, beans, cauliflower, and tomatoes with spices.Every region has its own recipe to cook pilaf. 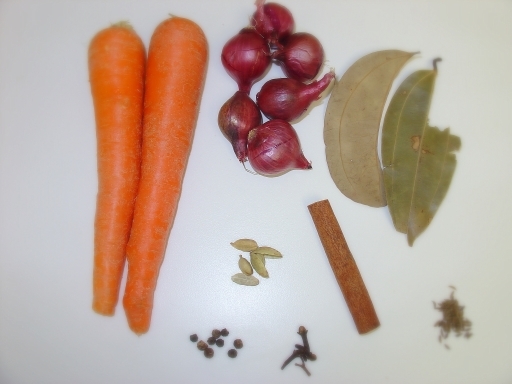 Depending on the region, the ingredients vary and the blend of spices is different. When aromatic basmati rice is cooked with everyday vegetables and spices produces a subtle, delicious pilaf which satisfies everyone around the table. This popular vegetable rice dish makes a tasty light brunch or supper. Recipe source is from vegetarian cookbook. Wash and soak rice in water for 30 mins. Heat oil in a large frying pan add sauté cumin seeds for 2 minutes, Add bay leaves, cardamom and cloves and sauté for another 2-3 minutes. Add onions and cook until softened and lightly browned. Now add carrots and cook for another 2-3 minutes. Drain the rice and add to the pan along with peas, corn and cashew nuts and sauté for 4-5 minutes, stir in cumin powder and mix well. Add salt, water and bring to boil. Cover and simmer for 15 minutes over low heat until the water is absorbed. Let it stand, covered for 10 minutes before serving. Shift it into serving dish fluff up before serving. Or you can finish the dish in rice cooker or pressure cooker. Enjoy with raita or gravy curry. You can use frozen mixed vegetables, Defrost and then add to the dish. To jazz it up you can add raisins and pistachios. To add more flavor you can use vegetable stock instead of water. 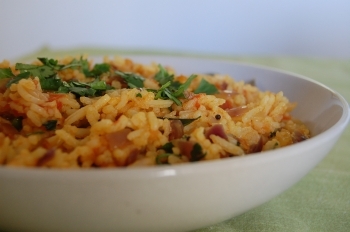 This rice pilaf is called pilav by the Turkish, Bosnian, Serbian and Romanians. Indians call it pulao/ pulav, Americans call it pilaf while the Persians call it polow. What do u want to call it, pilaf, pilau, perloo, peelaf or perlau? Pulihora is an authentic andhra recipe made of rice. 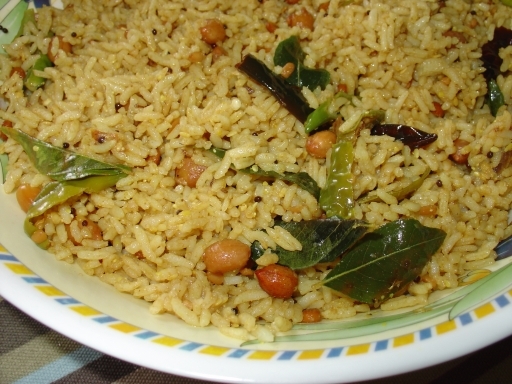 It is commonly known as tamarind rice, also known as chaddi in areas like vizag and srikakulam area. Pulihora is commonly served as prasadam at temples and it tastes delicious. Pulihora is also known as poor mans feast. You can feel the sour, tangy, spicy taste all in one wonderful dish. Pulihora is a regular at my house for all the festivals. Every time my mom and my mother-in-law prepares, they make a big batch as everyone loves it soo much and we eat for breakfast, brunch, lunch and even dinner. Pulihora is made in difference varities (rice, ravva, lemon, mango). Heat oil in a pan on medium flame, add urad dal, channa dal, peanuts, whole red chilles and fry till light golden brown. Add mustard seeds, hing and fry till mustard seeds start to crackle. Add green chillies, curry leaves, turmeric, tamarind pulp, salt and cook for 10-12 mins on medium flame. When the mixture becomes thick, turn off the heat. Add rice and sesame seeds powder and mix well. Adjust the seasoning and serve. Sesame seeds powder is optional. You can add ginger also. Add it along with green chillies and curry leaves. If you are allergic to peanuts you can substitiue with cashewnuts. The rice should not become too soft, each grain of the cooked rice should be seperate and rice should be cold. I usually cook rice for pulihora in a rice cooker and spread it in a plate to cool.